Let Flow Plumbing Repair Your Garbage Disposal! Is your garbage disposal broken? Can you hear the motor whirr, but nothing spins? Or does nothing happen at all when you turn it on? Don’t worry, Flow plumbing is your local garbage disposal repair, replacement, and install expert. Call us now at 214-388-8838 for an affordable and high-quality fix. 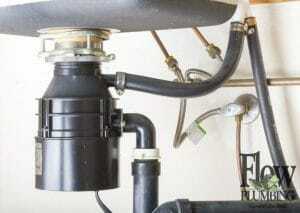 Flow Plumbing has been repairing and replacing broken garbage disposals for over 25 years. We are a team of professional, licensed plumbers serving our great area of Mesquite and all of it’s surrounding areas. We take pride not only in the quality of service we provide, but also that we will work to find you the most affordable solution to your problem. Each plumber is expertly trained to quickly pinpoint the issue, thoroughly explain our recommended fix, and then at your request, get you a working garbage disposal again. What causes a garbage disposal to stop working? Get your garbage disposal fixed now! Remember, when you need plumbing help in Mesquite, go with the flow!